Both polyester composite (PCO) and polytetrafluoroethylene (PTFE) dual meshes are commonly utilized for laparoscopic ventral hernia repair. Sparse information exists, however, comparing perioperative and long-term outcome by mesh repair. A prospective database was utilized to identify 116 consecutive patients who underwent laparoscopic ventral hernia repair at The Mount Sinai Hospital from 2004-2009. Patients were grouped by type of mesh utilized, PTFE versus PCO, and retrospectively compared. Follow-up at a mean of 12-months was achieved by telephone interview and office visit. 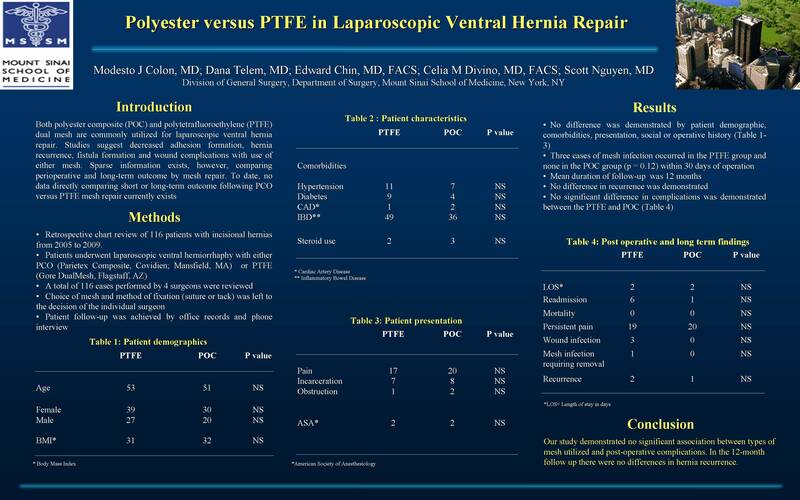 Of the116 patients, 66 patients underwent ventral hernia repair with PTFE and 50 using PCO. Patients were well matched by patient demographic. No difference in mean body mass index (BMI) was demonstrated between the PTFE and polyester group (31.8 vs. 32.5, respectively; p=NS). Operative time was significantly longer in the PTFE group (136vs.106 minutes, p<0.002). Three mesh infections occurred in the PTFE group and none in the polyester group (p=NS). No other major complications occurred in the immediate postoperative period (30 days). At a mean follow-up of 12-months no significant difference was demonstrated between the PTFE and polyester group in hernia recurrence (3% vs. 2%), wound complications (1% vs. 0%), mesh infection (3% vs. 0%), infection requiring removal (1% vs. 0%), bowel obstruction (3% vs. 2%) or persistent pain or discomfort (28% vs. 32%), respectively (p=NS). Our study demonstrated no significant association between type of mesh utilized and perioperative or 12-month outcome. Choice of either mesh appears to result in equivalent outcome, and can be left to surgeon or institutional preference.